I was testing the feasibility of adding an overlay to openlayers map that is displayed on a mobile/tablet device . 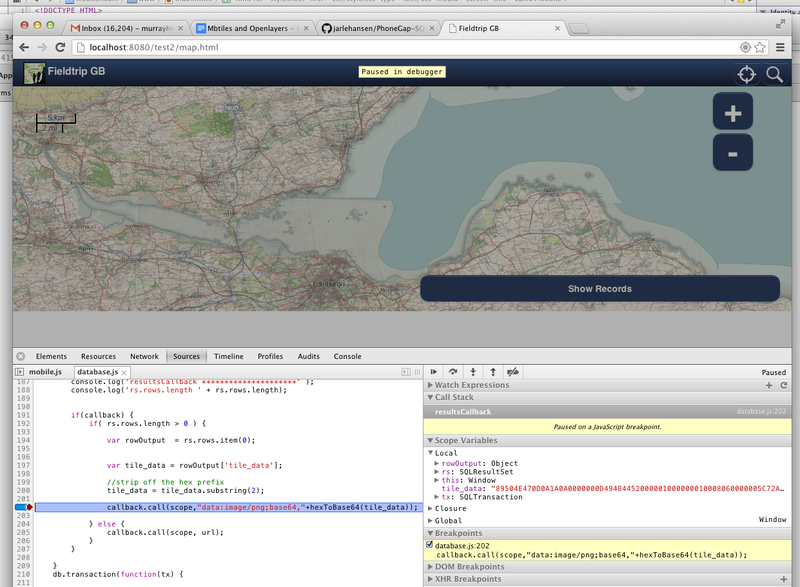 The overlay is going to be in mbtiles format the made popular by MapBox. The mbtiles db will be accessed locally on the device this useful when bandwidth is poor or non 3g tablets . The mbtiles format is http://www.mapbox.com/developers/mbtiles/ described here. Its is basically a sqlite database that holds a collection of x,y,z indexed tiles. Webkit based browsers including mobile versions support this although its not actually part of the Html5 spec. The main issue of using mbtiles locally is actually getting the database into the right location. Another is the speed at which the device can render the images. The overhead in extracting blob images to the resulting base64 encoded images. There are a couple of ways this can be done however. You can use the FileTransfer object in phonegap to copy the database locally from a server. It will be downloaded to the Documents folder on the iphone by default. example code to download an mbtiles db. Use the phonegap web sql plugin https://github.com/pgsqlite/PG-SQLitePlugin-iOS.git and open the database like. The benefit of using a phonegap sqllite plugin – allows flexibility where you download the mbtile db to and removes the device dependant limits on database size. Also if a browser drops native web sql support then it doesn’t matter. Rather than download a remote database you could copy over a local database at startup. If you want to keep it an entirely non-native web app based solution or desktop browser (webkit based – Chrome Safari you might be able to use a tool like. There are more suggestion on stackoverflow here but I not tried them. By using the syncing by creating an empty local mbtiles database and then populating it by inserts via data from the server is going to adversely affect performance. I have not tried this so I dont know how well it would work. First thing is to subclass an Openlayers TMS class. * Map with local storage caching. *     isBaseLayer    - is this the base layer? var z = this.serverResolutions != null ? as it will have to receive images from the local sqlite database asynchronously as web sql has an asynchronous callback style API. All this does is invert the y axis tile to handle openstreetmap not required for google style TMS. The is a good site that describes the various types of TMS around. When you have larger blobs in the database you can’t use the overloaded array version of String.fromCharCode as I was getting stack memory issue on the device. (iphone). So you have to loop through and build it manually. You have to use the quote function on the tile_data blob to turn it into a hex string. Then trim the hex prefix X’ of the hex string before base64ing. or Chrome on mac as well. This approach is a bit convoluted. Not tried it yet on Android but should work. Worked in the Chrome browser on the linux box. It does allow you to use rich openlayers framework cross platform without having to invest in native versions. Also you can debug and test using a desktop browser which is fast before doing proper testing on the actual device. Example Screenshot working on iphone3g using Phonegap and Mbtiles. Development version based on our Fieldtrip GB app http://fieldtripgb.blogs.edina.ac.uk/ available on android and iphone. Overlay is historic map in mbtiles format from the National Library of Scotland. I’ve written a local tile cache control which makes it very easy to access tiles from the local filesystem. If not in the local cache it falls through to get the tiles from the regularly configured source. No database required! then “build” the single openlayers.js file. Very interesting will take a look. Is this worth considering for the Openlayers distribution or is there something else already doing this… I haven’t looked in a while.